Andrew’s series of concerts featuring the North German pupils of Sweelinck, the ‘Orpheus of Amsterdam’, continues with two recitals of music by one of his most distinguished pupils, Samuel Scheidt. His influential three-volume Tabulatura Nova was published in 1624. It is one of the most important of all collections of organ music. Its 58 pieces are a comprehensive demonstration of compositional styles. This recital, played on the William Drake organ in the Grosvenor Chapel, features three large-scale pieces from Volume 1 of the Tabulatura Nova. The next Scheidt recital will be on the famous Frobenius organ in the chapel of The Queen’s College Oxford, on Wednesday 24 October 2018, starting at 1:10. It will be of pieces from Volume 3 of the Tabulatura Nova, in the form of Lutheran Organ Vespers. Both concerts are free admission, with retiring donations welcomed. The ‘Wetheringsett’ organ is a reconstruction of a Tudor organ based on the soundboard of an organ that was found during alterations to a farmhouse in the village of that name in Suffolk. Until it was hidden away within the walls of the farmhouse, is seems to have been used as a dairy door. The many holes in the wood were initially thought to indicate some sort of protection from the evil eye, until a local organ builder recognised it as the soundboard of an organ – the bit hidden away inside the instruments where the feet of the pipes sit, and through which the air is channelled from the windchest to the pipes. Analysis of the number and size of the holes can give a pretty accurate account of the size, range and number of stops of the organ. Tree-ring dating suggests that the wood dates from around 1525, leading to suggestions that this could be the organ known to have been purchased by a large parish church in Debenham in that year. Under the aegis of the Early English Organ Project this organ, along with a smaller instrument based on another soundboard found in Wingfield Church, Suffolk, was reconstructed by organ builders Goetze & Gwynne in 2002. Under the management of the Royal College of Organists, the Wetheringsett organ is now resident in the church of St Swithun’s in the centre of Worcester, a delightful Georgian church with box pews and a later 18th century organ. For this recital, I will be playing English music from before, during, and just after the 1520s, with pieces from c1360 to one of Thomas Tallis’s two extraordinarily monumental Felix Namques, dating from around 1560. In contrast I will play a Voluntary by Samuel Wesley on the 1795 Grey organ, published just a few years after the date of the organ. Franz Tunder was one of the most influential organists and composers of the early to mid 17th century in North Germany. Along with a group of Hamburg organist composers, including Jacob Praetorius, Scheidemann, and Weckmann, he created the musical development that culminated in Dietrich Buxtehude, Tunder’s son-in-law, and successor at the Lübeck Marienkirche. He was key to the development of the extended Chorale Fantasia and the dramatic Stylus Phantasticus. In 1646 Tunder founded the famous Abendmusiken series of concerts in the Marienkirche. These were funded by, and performed to, Lübeck businessmen, and were continued by Buxtehude and then well into the 18th century. In Tunder’s day, the Abendmusik concerts were usually organ recitals. In this programme, you will experience some of the organ music that could have been heard during these concerts, which were very much in the tradition of today’s London lunchtime concerts. The 2012 Richards, Fowkes & Co organ in St George’s, Hanover Square (Handel’s church) is eminently suitable for music of this period. More to come. See http://organrecitals.com/abw. This is one of series of the Mayfair Organ Concerts. The lunchtime concert was given by Andrew Benson-Wilson who specialises in the performance of early organ music, ranging from 14th century manuscripts to the late Classical Period. The original organ at St George’s was built in 1725 by Gerard Smith. The old case has been extended to contain a new organ which was completed in 2012. The concert consisted of one work: Matthias Weckmann’s (1616-1674) monumental seven verses on the choral melody ‘Es ist das Heil kommen her’. At a playing time of about 35 minutes it is perhaps one of the longest and most extraordinary works of its time. The story follows that Luther, on hearing the melody sung by a beggar, was reduced to tears. who has done enough for all of us. Although the hymn has 14 verses there is little correlation with the seven organ verses. This evidences a performance as an individual work rather than part of a church service. Andrew provided ample programme notes to describe the treatment of the chorale theme and gave a short introduction to the lunchtime audience. The performance had a confident and assured touch of someone who understood the musical style. His clarity of counterpoint allied to the programme notes helped the listener to identify the processes and individual lines of the music. The original Classical Events review is here. Andrew Benson-Wilson plays the monumental set of 7 verses on the Lutheran chorale ‘Es ist das Heil kommen her’ written by Matthias Weckmann (1616-1674). 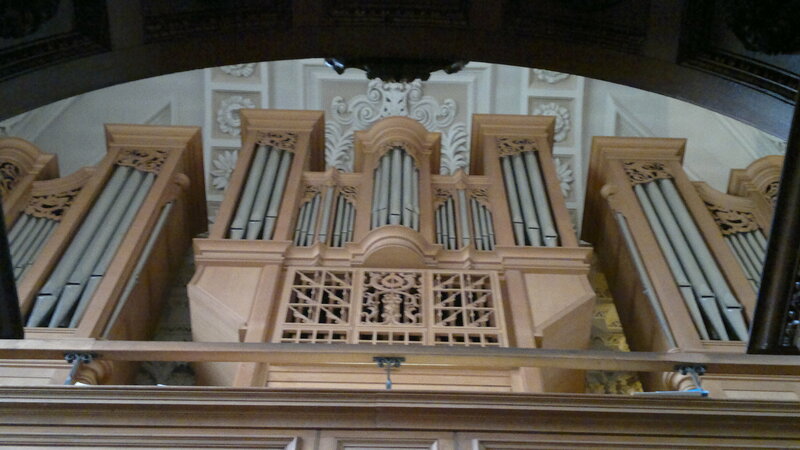 Lasting about 35 minutes, it is the longest such organ work from the whole of the 17th century. It includes, as the sixth verse, the most extensive and most complex Chorale Fantasia of that era. It is played on the 2012 Richards, Fowkes & Co organ in St George’s Hanover Square, based on North German 17th/18th century organs. Friday 29 July 2016: 1pm. Samuel Wesley was born in Bristol 250 years ago. He was the son of Charles Wesley the hymn-writer and nephew of John Wesley, founder of the Methodist Church. He was a child prodigy, writing his first oratorio, Ruth, aged 6. When he was 8, the composer Dr William Boyce referred to him as the ‘English Mozart’. His family moved to London when he was about 12, living in Marylebone. He led a colourful life, some of his apparent eccentricities possibly being caused by a serious head injury when he was about 21. An organ virtuoso, Samuel Wesley was the leading pioneer of the Bach revival in England. Bach seems to have been a strong influence on his Opus 6 Organ Voluntaries, published between about 1807 and 1820, and the focus of this recital. The wonderful William Drake reconstruction of the Dallam/Smith/England/Lincon/Gray & Davison organ, contains some of the oldest pipework in London. It is very well-suited to Wesley’s music as, in its current form, it represents the English organ in the early years of the 19th century, with strong reminders of the earlier 17th and 18th English organ style. The church is just behind Centre Point/Tottenham Road Court station. In the 14 months since it started, this website has received more than 25,000 hits from people in more than 100 countries. Judging from the map, I have still to break into central Africa, Paraguay, Greenland, Mongolia, Kazakhstan, and the scarier parts of the Middle East. Andrew Benson-Wilson will give a special organ recital to celebrate the 400th anniversary of the dedication of the the Chapel of Christs of Alleyn’s College of God’s Gift in Dulwich. Andrew will play music from the years around 1616 on the famous 1760 George England organ. Andrew Benson-Wilson plays the famous 1723 Hildebrandt organ in Störmthal, Leipzig (where Bach gave the opening recital), on Wednesday 15 June 2016 at 7pm, during the Leipzig Bachfest. The programme explores composers with Central German connections in the years before Bach – and by Bach. on the famous Frobenius organ in the Chapel of The Queen’s College, Oxford. A recital of organ music by the Hamburg master organist/composer, Matthias Weckmann, born 400 years ago this year. A pupil of Schütz who, in turn, was a pupil of Giovanni Gabrieli, Weckmann studied and worked in Dresden and Denmark. A friend of the influential Froberger, Weckmann settled in Hamburg in 1655 as organist of the Jakobikirche. He died in 1674 and is buried beneath the Jakobikirche organ. Admission free – retiring collection. Organ information here. Paul Hofhaimer (1459-1537) Salve Regina 5v. The start of the Renaissance is difficult to define. In organ music, around 1450 seems a reasonable date, with music from the likes of the Buxheimer Orgelbüch and the Faenza Codex combining elements of Medieval and Renaissance styles. By this stage, the organ had a fully chromatic keyboard, sometimes more than one manual, and independent stops were beginning to be separated out from the Medieval ‘Blockwerk’ – the equivalent of single mixture where one note plays a chorus of ten or more notes. A rare chance to hear some of this fascinating and little-known repertoire, played on the Frobenius organ during its anniversary year. Conrad Paumann (c1410-1473) Gloria de Sancta Maria Vergine 8v. Arnolt Schlick (c1460-c1521) Da pacem 3v.